Tape off the area of the basket you are not yet spray painting. Spray the area not taped with Gloss White. Let the basket dry and tape off the already painted area. Now spray the unpainted area with Gloss Pewter Gray. 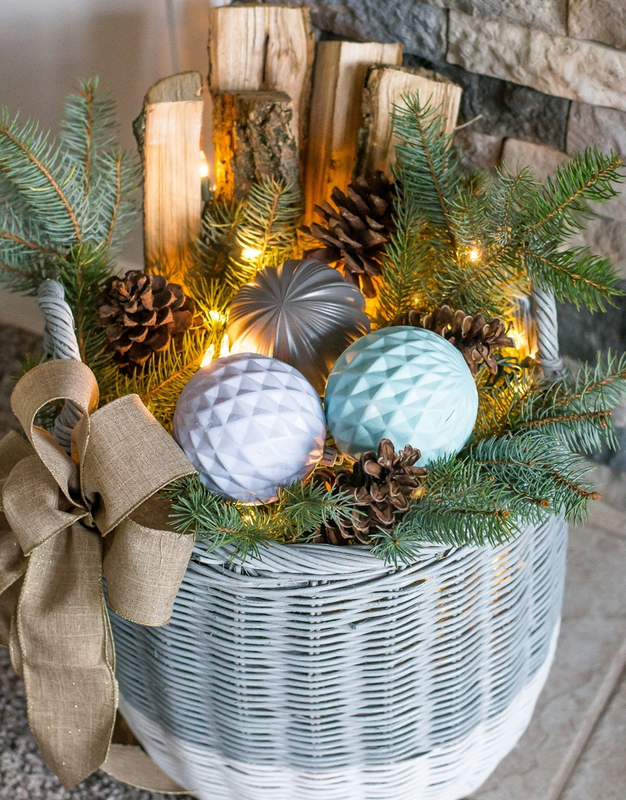 Spray a few ornaments complimentary colors — Matte Deep Gray, Matte Aqua, and Matte Glacier. Use newspaper as a filler and then add evergreen clippings. Add holiday lights and tuck the cord between the firewood. Next, Add the painted ornaments and pinecones. Create a bow out of the wired linen ribbon and use wire to tie it to the basket.